Last week took the Sister Leadership team back to the Rideau Club for another wonderful Women’s Executive Network (WXN) breakfast. This month’s topic: The Good Leader was moderated by Shannon Gorman, National Director of Community Affairs at Telus. 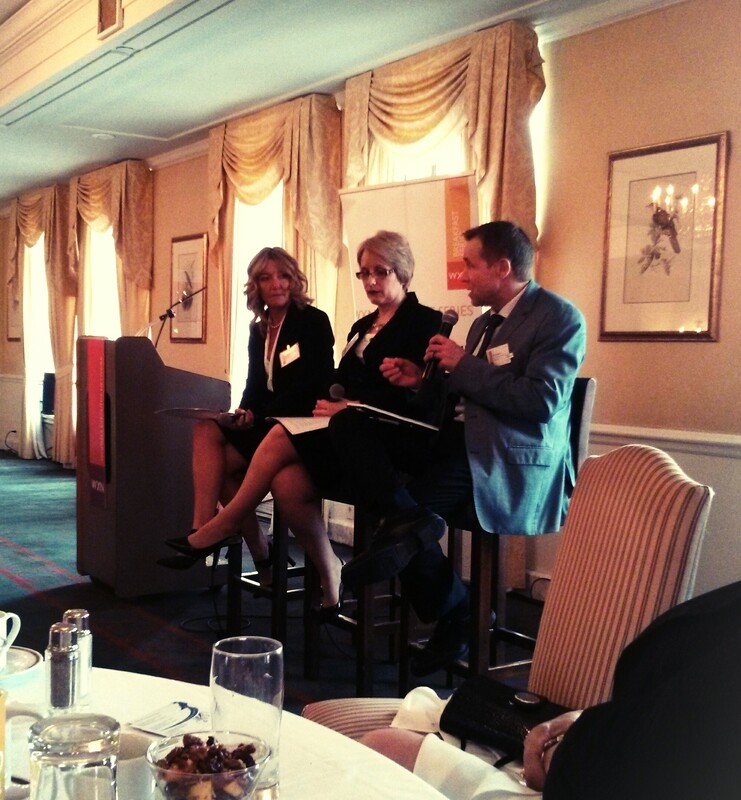 Shannon guided the conversation as Lyne Parnet-Garvey, Chief Human Resources Officer at the Hydro Ottawa Group of Companies, and Paul Melia, President and CEO at the Canadian Centre for Ethics in Sport (CCES) shared their thoughts on leadership. It was an impressive panel! As the conversation began to roll, I couldn’t help but notice how well Lyne and Paul’s responses to lessons in leadership fit into the definition for being in the flow. Shannon kicked off the conversation, asking whether Paul or Lyne had been born with the confidence to lead (capability), or had developed it along the way? For Paul, it was a combination of learning how to step back and watch, while also building a bank of knowledge he could carry into more senior positions. Both Lyne and Paul put an emphasis on values and purpose in their leadership approaches. As Lyne described how she saw a good leader (identity), she touched on observing the values of her team. “I am privileged that our organizational values at Hydro Ottawa align with my personal values,” explained Lyne. “That’s one of the biggest challenges for us. When you are in an organization and you have a disconnection between the values of an organization and your own personal values . . . that’s almost impossible to sustain. Being a values based individual, being a values based organization, that’s fundamental. I’ll share with you our organizational values, and how those are my personal values as well. Teamwork – although we have a definition from an organizational perspective, for me it’s all about working together. It’s all about respecting each other’s viewpoints and opinions. Integrity is the other value. To me that’s the most important one . . . I always stress that value as being the most important. It’s about trust and doing the right thing, it’s about taking responsibility for your actions and taking responsibility for your mistakes, and being ethical when you do it. You hold yourself to the highest ethical standard no matter what . . . Excellence – I expect quality work. I expect great work, and I enable my folks to deliver that great work. I’m committed to quality, safety of our people, and continuous learning. All of this rung such a note within my own leadership style and especially Lyne’s comments about hiring from a perspective of potentiality. To really gather a great team, a values based approach to anticipating potential and investment is just how I went about finding the talented folks who help fuel Sister Leadership. Experience and education are both wonderful things, but if you don’t align values while crafting a team – values like integrity, you’ll miss some important connections and that passion for excellence. Of course for us at the blog, this doesn’t mean the team’s opinions need to always agree, but to honour serving community, respecting viewpoints, and giving a voice to women leaders is a huge part of producing good work. In my opinion, potentiality has five key markers: intrinsic motivation, curiosity, insight, engagement, and determination. What makes someone successful in a particular role relevant today might not be tomorrow’s fit. It appears, at least in my world, that potentiality trumps experience and education. An interesting article on what the latest creative leaders are thinking on this subject is The Big Idea: 21st-Century Talent Spotting. So much was said at the WXN breakfast that was worth sharing. We can’t capture every single moment, but we hope you enjoyed these highlights of leadership that is in the flow of values, identity and purposeful living. If you want to watch the TED Talk Paul had mentioned, “How Great Leaders Inspire Action”, you can do so right here since we’ve embedded it into this post! Sister Leadership would like to thank the WXN for yet another inspiring breakfast – seriously, the room is always full to the brim with jaw-dropping talent and stories. How do you approach leadership, and how has that approached changed over the years? What do you think of the new era of management thinking around potentiality and talent retention? What are your key indicators of potentiality? We’d love to hear your stories in the comments. ← How is it that we delete experiences?